If you’re an American prisoner unhappy with your sentence, you might want to start brushing up on your IT skills. This story of an inmate who objected that giving limited Westlaw access wasn’t the same as providing a legal library turned up in my RSS feeds via Library Stuff. I can understand his problems with Westlaw, although it’s actually one of the less painful legal databases to use (Lexis – why? WHY?!?!). As the story says though, he’s not likely to win his case, so the books will be going, and occasional Westlaw access will be staying. Which ain’t fun if you’re not confident on a computer, and have restricted access. Do we have a similar sort of requirement for prisoners to have access to law libraries and legal materials? Do UK prisoners have any sort of ability to do legal research on their own behalf? Last night, through nefarious means*, I was invited to the launch of a series of short films on the Session Cases, by the Scottish Council of Law Reporting. 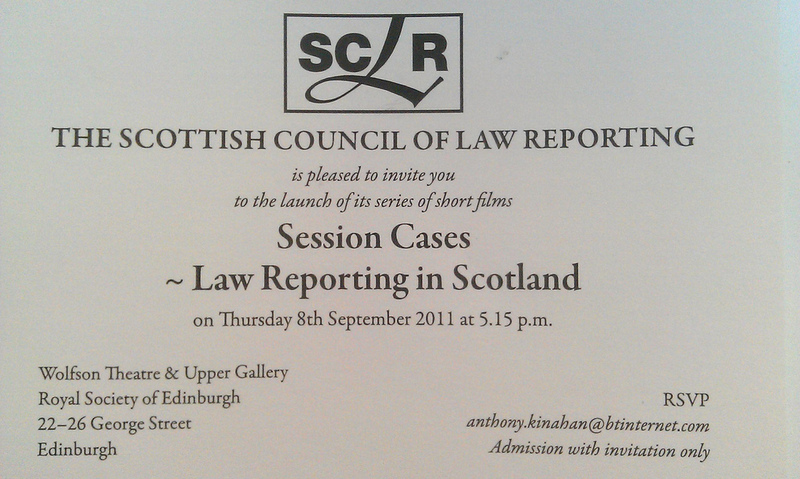 The Session Cases are the most authoritative series of law reports in Scotland, and they are created and published by SCLR. The videos are 5-6 minute segments, available on a dedicated YouTube channel, which outline the history and effects of the Session Cases on Scots law, how the Session Cases developed, how they are put together and by who, and how they are used in court. The video clips themselves are well produced, high quality films, with interviews and commentary from everyone who uses the Session Cases, from the judges and Advocates who write, review, edit and use them in court, to the Advocates Library staff who maintain the collections of Session Cases for the Advocates, and the Session Papers that support them. Definitely a useful resource for law students, law tutors, those who have to source Session Cases for users, and anyone interested in how Scots Law works. And, of course, the Paisley Snail makes a regular appearance throughout, in all its ginger beery glory. One thing I’d disagree with though – the videos said how wonderful it was that most Session Cases were now available as pdfs of the original pages. This is good because it means that the judge and counsel are looking at literally the same page. I’m sorry, but I don’t see this as a good thing: why is a pdf of a page better than an electronic version? They’re often difficult to read, and when passed between parties as an attachment to an email, they aren’t searchable in the same way as an electronic version is. Insisting on pdf versions is a backwards step, and it probably wasn’t disputed because the judges who were interviewed in the videos are the group who prefer the pdf versions. *It appears that I was invited because I’m technically in charge of my professional group. The inviting system was somewhat odd – the audience consisted mainly of the people starring in the videos, and the people who had made the videos. No actual end users seem to have been invited (I was one of 4 law librarians in the audience, and we all seem to have been invited because we’re allegedly Proper Professionals (me) or were in the video, or were linked to SCLR), and I’m unsure how SCLR are planning on publicising this to their target market, which I assume is law students/law schools. “Salmon principles” are actually the six cardinal principles used to protect persons whose reputations might be affected by a tribunal of inquiry. They do not, in fact, refer to a certain type of fish having a strong moral fibre. Bareboat charter and bottomry bonds are both terms relating to ships, not dodgy “adult” films. Yes, I’m definitely here. I exist, I have a reflection (and am therefore also not a vampire, which is reassuring), but it seems I am actually a phantom. If you look for me, I am not there. Search my employers website – I don’t exist. Look on the websites of law firms…I know those other law librarians are out there: fee earning, creating bulletins, researching for clients…so where are they? They’re not on the online staff lists, there’s no images of law firm librarians looking dazzlingly smart and intelligent while leaning against the shelves of books that they’ve carefully sourced and selected for their Library (a favoured pose for lawyers in corporate photos: books = smart, apparently). But we’re just as essential to the health of the firm as any other members of staff, who get a shiny profile and “look how fab and experienced our staff are” blurb on the website. So…why are we hidden away by our employers? Do they think that by admitting that they have employed experienced professionals to deal with specialised information, that they’re weaker than their competitors in some way? Surely it’s a great selling point to clients, to be able to say that they have people dedicated purely to finding the answers needed for all the questions that could arise? Or do we suffer from the same problem as all other librarians: once we’ve handed over the work that we’ve done, it’s immediately forgotten that it was us that did it? That case/report/book/database just magically appeared when it was needed…. The phantom law librarians, pale ghosts in the law firm machine? It doesn’t matter whether you’re black, white or even just kinda patchy colours all over…in Boston, you’re able to serve as a juror. Yes, species is no barrier to being involved in turning those big, heavy wheels of justice! Ta to Greville Tombs for sending me this story.